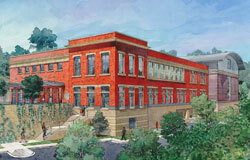 The Avenir Foundation Conservation and Collections Resource Center, the single-story portion on the southeast, is solely a support facility for The Textile Museum collections, GW's fine art collection and the Albert H. Small Washingtoniana collection, comprised of historic documents and maps related to the founding of Washington, D.C. There will be no public exhibitions or programs at this location. Please visit the George Washington University Museum and the Textile Museum in Washington, D.C. to experience a variety of exhibitions and programs. 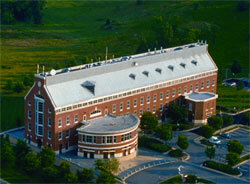 Discovery Hall, the three-story portion of the building, on the northwest, contains 21,000 square feet. The first floor contains two multi-purpose classrooms, a physics SCALEUP lab, lounge and study spaces. The second floor contains three wet lab classrooms and support spaces. Hours: 24/7 secure building. GWorld Card Access. Visitors sign-in with photo identification. Purchased in 2002 and renovated/reopened in 2003, this 204,000 square-foot facility facing Route 7 houses classrooms, computer labs, and offices. 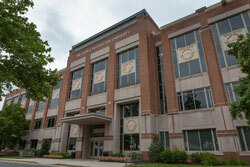 The Virginia Campus Library and the Foundation Center Cooperating Collection are located on the First Floor. Several University administrative offices and the Jason Project are also located in Enterprise Hall, as well as the university's main data center and art gallery areas (open to the GW community and the public). 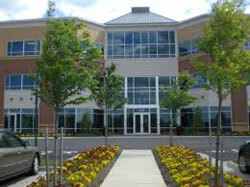 The main entrance to the building and parking are located on the lower level facing Route 7. Visitors need to sign-in with photo identification. Opened in 1991, this 77,000 square-foot research and education facility includes classrooms, offices, many research centers and laboratories and a computer lab. Hours: Monday-Friday, 7:30 a.m. – 9:30 p.m., Saturday 7:30 a.m. - 6:00 p.m. or access by GWorld Card. Purchased in 2008, this 71,000 square-foot building houses a number of departments, including the Office of the Dean, School of Nursing and the Computational Biology Institute. The building has classrooms, as well as several student lounges on the first floor. The main entrance is from the rear parking lot. Hours: Restricted access to building occupants only or visitors by appointment. 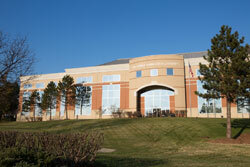 Completed in 2003, this 86,000 square-foot facility is leased by the National Transportation Safety Board Training Center for its investigation training facility and includes state-of-the-art learning spaces, an outside simulation court for accident reconstructions and other equipment used in training accident investigators. Training and conference center space is available for use by public and governmental organizations. Hours: Restricted access via GWorld card to building occupants only or visitors by appointment. GW's Finance Division, Division of Operations Finance and Office of Student Financial Assistance are located in this building. The university does not have classrooms in this building.